7 small websites changed that can deliver big improvements. Does your website contain these 7 things? Taking a consumer-centric approach to designing your website is VITAL to your success. You only get one chance to make a first impression and most users stick around for less than 15 seconds. So the question becomes, how do we get them to stick around? In addition to beautiful design, it starts with understanding the questions and problems a consumer has when the stumble upon your site and then meeting or exceeding their expectations right away. If your website is easy to navigate, leads me down a logical path, speaks to me as a customer, and tells me exactly what to do, then I’m much more likely to do business with you. Here are 7 changed you can make immediately to impact the performance of your website and turn those visitors into customers. The customer journey is centered around understanding how visitors interact with your website. Customers come to your site in hopes of solving a problem that they have. You need to identify what that problem is, empathize with that problem, position yourself as an expert and provide a solution that feels easy and right. If you visit Open Door, you’ll notice they identify and empathize with the customer’s problem which is the hassles of listings, showings and months of uncertainty. They offer an immediate (and enticing) solution which is “Get an offer on your home in the press of a button.” As you continue down the page, Open Door lists reputable companies in order to position itself as the trusted authority and then offers three simple steps to get started. Overall, open door absolutely NAILS the customer journey. When you think about your customers first, the questions they are asking and the information they want to know, you can begin to transform the structure of your site to take them from first learning about what you offer to eventually converting. Having several different CTAs on one single page. For example: If I am on your home page and you have buttons or links to schedule a call, read your testimonials, check your home’s value and an option to read about your services, then I am completely overwhelmed. I don’t know what to choose so I don’t choose any of them. There’s a concept that originated from Barry Scwartz called “The Paradox of Chocie,” which is simply the idea that eliminating consumer choices can greatly reduce anxiety for shoppers. Asking customers to complete the same action with different language. For example, when you use the phrase “Schedule a call” and “Book an appointment” which both lead to the same form, you are confusing the customer. Choose one phrase to use throughout your entire site and stick with it. 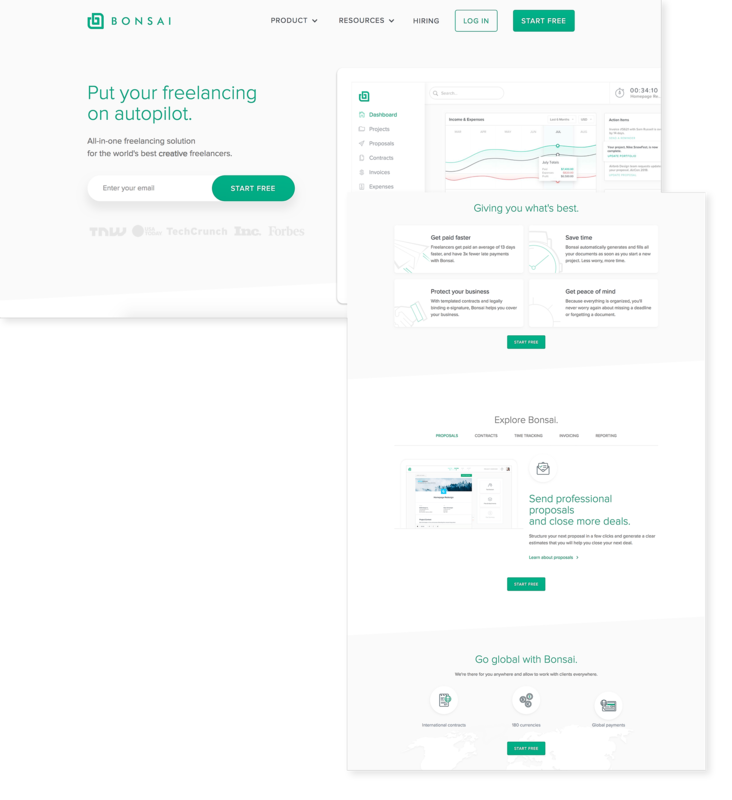 If you visit Hello Bonsai, you’ll notice they use “Start Free” extremely consistently throughout their site. In fact, it appears SEVEN times. I know exactly what they want me to do and I have the opportunity to start for free after reading each section. Don’t sound too stiff and corporate. Use a conversational tone. 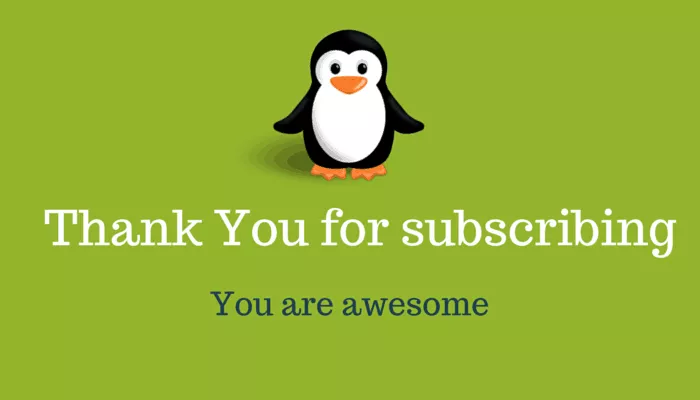 A simple hack to start implementing conversational tone is to use the word “you” in your website’s copy. They will feel like you are only speaking to them i.e. 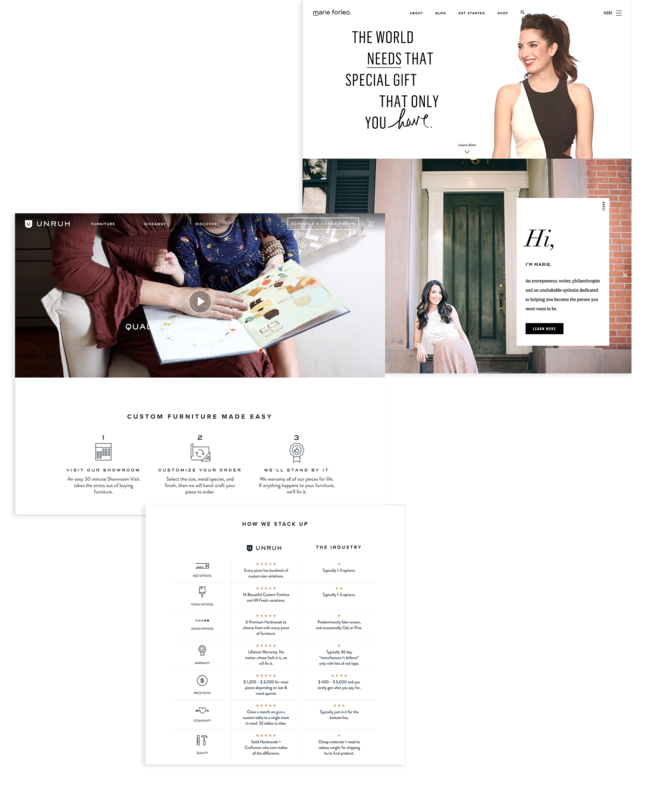 “We’re here to help our clients” vs “We’re here to help you.” If you visit Marie Forleo’s website, you’ll notice she does an exceptional job at speaking to her customers in a casual and relatable way. Her conversational style of writing makes it seem as though she is addressing you, rather than talking to the masses and because of that, you immediately feel connected to her. Use your customers words. Customers will only buy what they understand they are buying. When companies are speaking about their own product or service, they tend to use inside language that may seem obvious to them, but makes absolutely no sense to their customers. A great way to overcome this is using words your customers have used to describe your product or service. If you visit Unruh Furniture, you’ll notice they present a dining room table as “The Perfect Table” rather than a complex, confusing title such as “Haddigan Dining Room Table with built-in butterfly leaf extension.” This strategy allows potential customers to fully understand your product which brings them one step closer to purchasing. Bonus: To implement this technique, read through some of your best testimonials and use common words and phrases throughout your website! A common mistake people make is providing too much information. It sounds counter-intuitive because you want to help potential customers make an informed decision, but the reality is people don’t read everything that’s on your site. Web content is meant to be skimmed. According to SearchEngineLand, you should start each section or paragraph with your most important and compelling verbiage. Visitors typically look at the first line to see if it pertains to them and what they want so make it count. 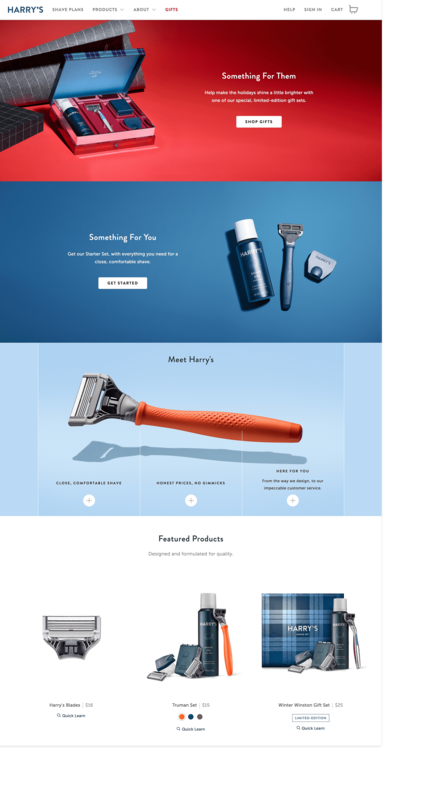 If you visit Harrys.com, you’ll notice their extreme minimalist approach. 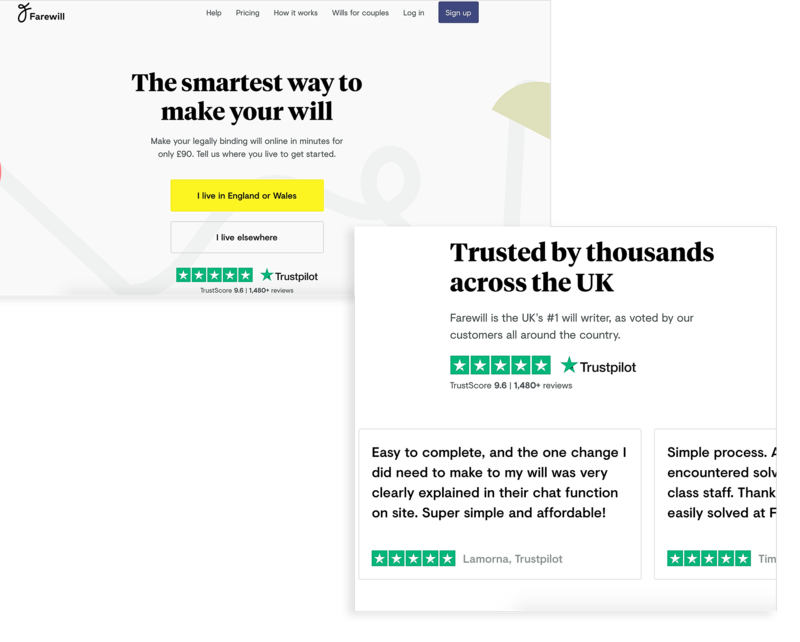 With less than 100 words total on their home page (76 to be exact), Harry’s effectively delivers what they offer, who they are and how they’ll benefit you. Microcopy is one of the best ways to overcome your customers objections. Microcopy is the small text that appears below the primary CTA on your site. Think of your primary CTA as the equivalent of asking someone to marry you. Customer’s have to be compelled and convinced that they should click. If they’re not quite ready to click on it, you can use microcopy to eliminate their hesitation and overcome their objection. To implement this right away, think of the one question or hesitation your customers have that prevents them from moving forward on your site. Overcome that within your microcopy. Social media allows us to connect with your customers on a daily basis. Think about this: how many times per day do you look at Instagram, Facebook, Twitter or Youtube compared to the amount of times you go directly to a specific website? Social allows you to develop a relationship with customers by continuously updating your profile with valuable content that establishes you as the expert and organically grows your reach. If you have quality content, people will follow you. If you visit KrissDidIt.com and scroll all the way to the bottom, you’ll notice a preview of her Instagram reel with an invitation to “be her friend” and follow her. 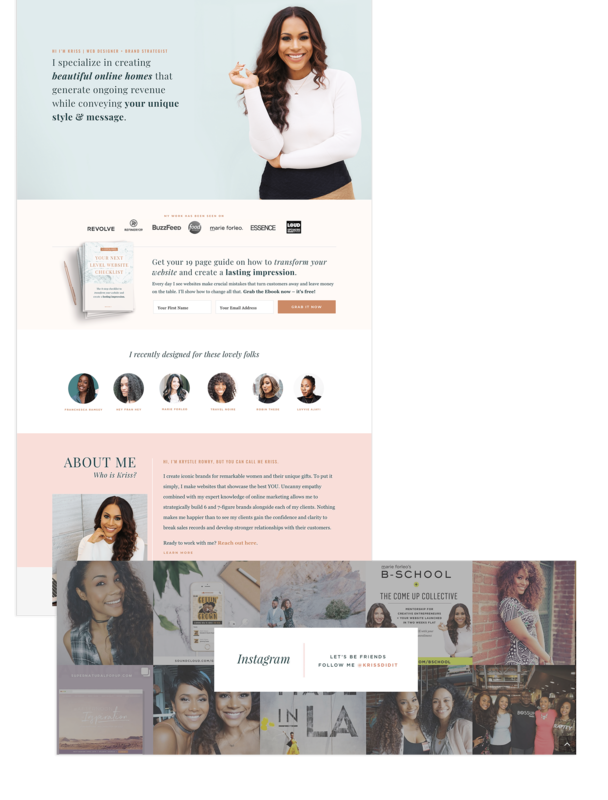 This not only allows her to develop rapport with her site visitors, but it also gives consumers who might not be ready to work with her yet the option to stay connected. BONUS: A great plug-in tool for adding social accounts to your website is ElfSight. It’s super easy to use and doesn’t require any coding! When a visitor is giving you their personal information (in this case, e-mail), they are very interested in you and what you have to offer. Take advantage of this moment in their journey and provide additional value. Some ways to do this are linking them to another relevant piece of content or offering something for free. 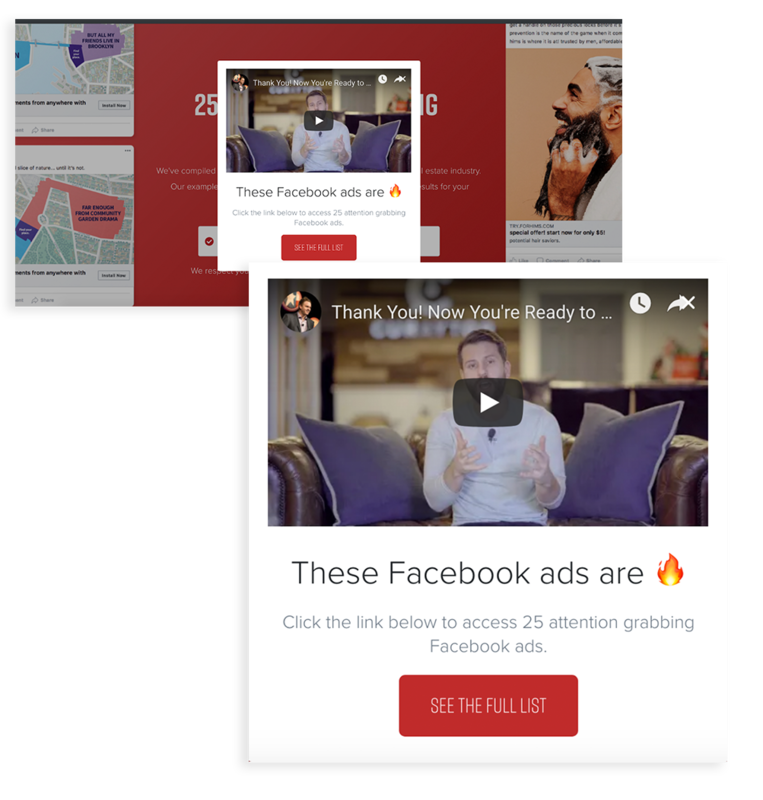 In our latest lead generation campaign, 25 Attention Grabbing Facebook Ads, we do more than just provide the list to the subscribers. When they click “See the list,” a 40 second video appears which offers viewers a free audit of their Facebook ads with one of our Curaytor experts. The goal with this video is to add even more value to the customer who has already begun to position us as authorities in their mind. do you want help Turning your website into your best salesperson?